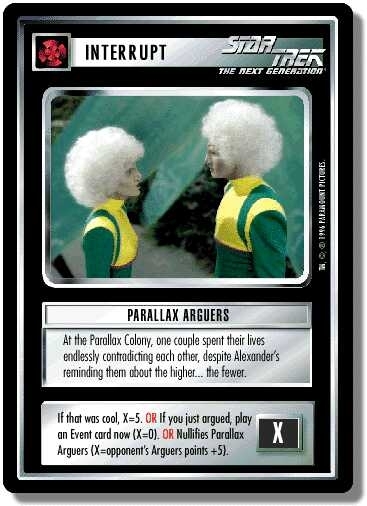 At the Parallax Colony, one couple spent their lives endlessly contradicting each other, despite Alexander's reminding them about the higher... the fewer. It his was cool, X=5. OR If you just argued, play an Event card now (X=0). OR Nullifies Parallax Arguers (X=opponent's Arguers points +5. Point-Box on card: X bonus points (you score points, when you play or use this card). This interrupt has multiple functions. During initiation of the card play, you must declare which function of the interrupt you are using and meet any conditions for using that function. If you do not meet the conditions for that function, it is an invalid card play and the card returns to your hand. See actions - step 1: initiation. The condition for using the second function of the card is that “you just argued” over the coolness of the last game action. This means that you said it was cool, and your opponent disagreed. No other “arguments” count for this card. Just after a game action is completed, say “That was cool,” and attempt to play PA. If your opponent does not disagree, carry out the results of the first function: place the PA in your bonus point area, with X=5. If your opponent disagrees, return the PA to your hand; it was an invalid card play(the condition was not met). You now meet the conditions for the second function. If you want to use that function, say, “We just argued,” and play the PA. Carry out the results of the second function: play an Event card from your hand, and place the PA in your bonus point area with X=0. If you do not want to use this function, you don’t have to. I respond by playing another PA to nullify yours. Yours is now discarded; for mine, X=15. In other words, if we play a chain of PAs, each one nullifies the previous one, and the last player to play a PA scores a total of 5 points for each PA in the chain. All PAs except the last, unnullified one are discarded. The last one goes in its owner’s bonus point area. Unless nullified, this interrupt is placed in your bonus point area regardless of its use, even if its point value is 0. (X=5, 0, or “opponent’s Arguers points + 5.”) Thus, it may not be retrieved and reused after using it to play an event. There are 30 entries for Parallax Arguers (ST1E 3 C 38) at the Tradeplace (156 haves and 1 wants). Click here to see all trade list entries for this Common card! Also see here for all trade lists with any card fom "Q-Continuum".